3DiS Technologies will be presenting “Ultra-Compact, High-Performance, 3D-IPD Integrated using Conformal 3D Interconnects” paper at The Electronic Components and Technology Conference (ECTC) 2018. Kindly attend to our CEO’s Ayad GHANNAM presentation the 31st of May at 3:55 pm in Session 23: RF and THz Module Components. The Electronic Components and Technology Conference (ECTC) is the premier international event that brings together the best in packaging, components and microelectronic systems science, technology and education in an environment of cooperation and technical exchange. ECTC is sponsored by the IEEE Electronics Packaging Society (formerly CPMT). 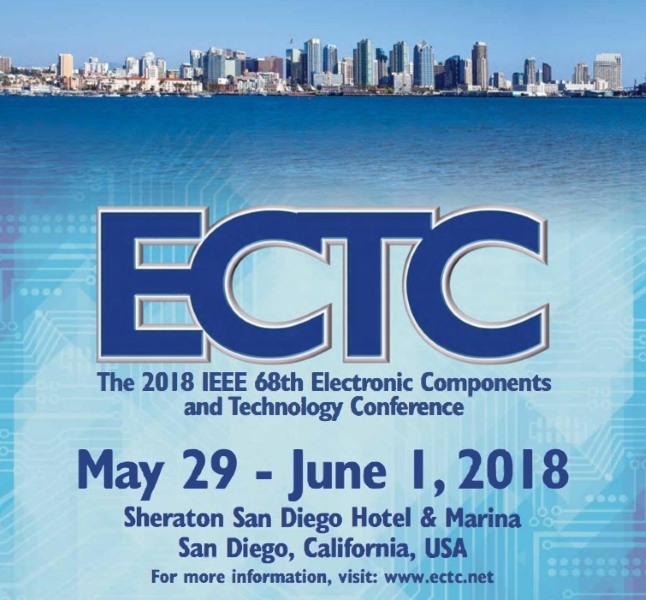 The 2018 ECTC will be held at The Sheraton San Diego Hotel & Marina, San Diego, California, USA, during May 29 – June 1, 2018, featuring about 40 technical sessions (oral presentations, interactive presentations, and student posters), 16 professional development courses, a panel discussion, a plenary session, a CPMT Seminar, and a technology corner for exhibitors.